Whether you come visit Niagara Falls often or if you’re interested in visiting for the first time, there are so many fun things to do while you’re here. Niagara is all about creating lasting memories. There’s something for everyone and entertainment for all ages. We’ve put together a list of some of the most popular places you won’t want to miss out on during your visit. All of these attractions are walking distance from the Falls so that you can make the most of your time in Niagara Falls, Canada. You can smell the aroma of sweet fudge as you make your way to Clifton Hill by the Falls. 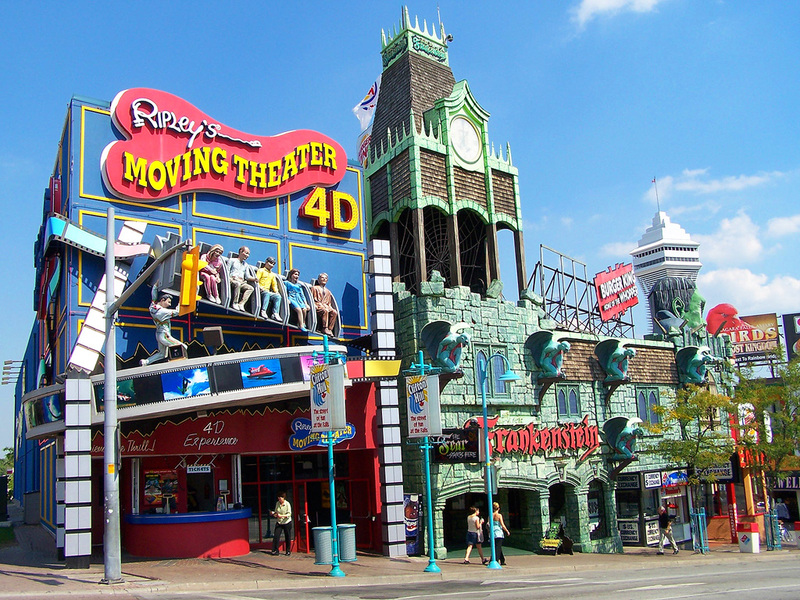 Clifton Hill is known as the street of fun and not only has amazing food but is home to mini-golf, arcades, wax museums, fun houses and a host of novelty gift shops. Visit the top of Clifton Hill to catch live theatre at the Greg Frewin Theatre or try see how brave you are at Nightmares Fear Factory. A 175 foot skywheel in the middle of Clifton Hill. Although the Skywheel is open daily, it’s an whole different experience after sunset. Snap great pictures of the Falls and the glittery lights of Clifton Hill from the top of the Ferris Wheel. If you’re with your significant other, it’s a very romantic way to experience the rainbow colours of the Illuminated Falls from 9p.m to midnight. Beat the heat and go for a swim at the Fallsview Waterpark. It’s just a two minute walk from the Falls and is North America’s largest indoor water park. There are 16 water slides, a massive indoor wave pool, hot springs, and an outdoor sun deck. The park hours vary depending on the time of year and an operating schedule is available online on their website. The most thrilling way to experience Niagara Falls. Enjoy the highest and most scenic views with up to seven people per ride. No reservations are needed as it is a walk-in attraction however, it is weather permitting. Helicopter tours function until sunset year round. Just a 5 minute walk from the Falls, you can experience a journey in search of the legendary Lost Kingdom. Encounter exotic birds, animals, and reptiles. The experience begins at the mysterious Old Museum where you’ll feel like you’ve travelled back into time with beautiful winged wonders flying freely around you! It’s a great experience and fun for all ages. With options for day, evening and Fireworks cruises this is definitely a must do Niagara Falls experience. The day cruise takes you up close and personal to all three of the Falls and is about 20min. long. The large catamaran boats let you be on the wildly churning waters but still have a smooth ride. The later cruises are a bit longer and have the option to purchase bar items. For an amazing view of the Falls, the Gorge and the Niagara Region the Skylon Tower is where you will want to visit. Their observation tower 775 ft above the Falls will amaze anyone. After an afternoon of fun and excitement, you’re sure to build up an appetite. Coco’s Steakhouse Bar & Grill is located right across the street from the Fallsview Casino. It’s a popular place to enjoy a great meal out on the Terrace while you enjoy the taste and Aroma of wood-fired steaks and pizzas. Be sure to check out live entertainment happening on the patio on the weekends beginning at 7 p.m. Free parking is available onsite however, it does tend to get busy so, it’s best to reserve a spot on the Terrace by calling Coco’s toll free at 1-855-377-9300.